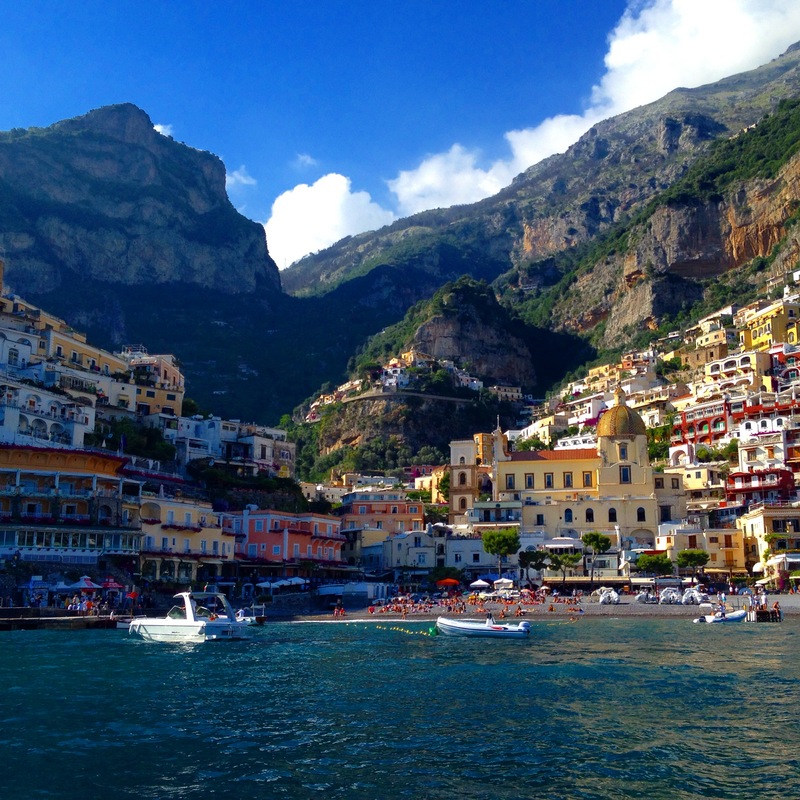 Being that this was my first trip abroad and I was also traveling solo, I decided to book a one-week tour of the Amalfi Coast with G Adventures. This decision was basically my way of calming my nerves about the solo trip; I am so glad I booked it! Not only did I meet several amazing people, I explored places and experienced activities I would have never found on my own. The second week of my trip was completely solo and equally magical, taking me through Rome and Florence. I couldn’t have planned it any better! Italy is a beautiful country with a rich history and culture. I loved every minute of my trip. My one regret was that I couldn’t stay longer. As the days flew by, I found myself jotting down a list of “lessons learned” in my phone, little memories or observations I made throughout my travels. Upon returning home, I created a photo book through Snap Fish and included my list of lessons on the last two pages of the book. The list quickly become a favorite way to remember the trip as well as share fun anecdotes with friends and family. It also started a new travel tradition for me in which I create similar lists of lessons learned every time I travel. Several of my lessons are valuable for future travelers as well, so I will share them with you. Here are my top lessons learned during my two-week travels through Italy! Feel free to share your own as well in the comments below. 1. Travel in Italy takes at least three times as long as you think it will. Planning a day trip to the country-side? Better take the first train out! Expecting to meet up with someone in a new city around a specific time? Go ahead and add on a few extra hours! I had to learn this lesson over and over again throughout my two weeks. Thankfully, I am a flexible traveler and it didn’t greatly impact any of my plans, but it certainly created some stress on a few occasions. A perfect example of this was the day I was traveling from Positano to Rome via train. I knew my exact route and general time tables for transportation. However, what I did not anticipate was my first mode of transportation, a ferry, was no longer running that day because of harsh sea conditions. On to Plan B – take the bus to Sorrento and pick up the train there. The problem with Plan B though has to do with lesson #4. The bus drivers had been staging several strikes throughout the week and therefore caused buses to run significantly slower than usual. I waited for oever an hour for a bus and then traveled another hour to Sorrento. From there I jumped on the first train to Naples and transferred to another train to Rome. Train travel in Italy is extremely valuable as there are many options and directions you can go, both in and out of Italy. The more money you are willing to spend, the faster the train you can take. On this occasion, I didn’t select the slowest and cheapest but I also didn’t choose the fastest and most expensive, thus tacking on more time to my travel plans. Did I mention that I was scheduled to meet the B&B owners in Rome at 2PM? I didn’t board a train in Naples until around that time, the ride was going to be another 2.5 hours, and with no access to wifi, I wasn’t able to reach the owners to inform them of my delay. Talk about a stressful day of travel! After arriving into Rome, I hopped on the subway and off again at my appropriate stop. I didn’t have any difficulty navigating the subway lines as they were clearly marked with color-coded maps. I will also give a shout-out to my 2 years of New York City living as it has prepared me with the confidence to navigate many a subway systems worldwide. When I came above ground however, I was in for another surprise…there were 8 different street options at this particular intersection, none of which were clearly labeled, and several under construction. I asked 3 different shop owners for directions to my street, each one of them sending me in a different direction. It wasn’t until I started wandering down a side street and stopped to ask my 4th person that I actually figured out the right way to go. I finally did make it to my B&B but it was about 4 hours later than expected and with several firm emails from the owners about my missed arrival time. Point being, travel in Italy will always take longer than you expect. Plan on it! 2. Naples has the best pizza by far. Sure, I haven’t tasted all of the pizza in Italy, but considering the fact that Naples is the birthplace of pizza, it’s simply the best. I have nothing else to say on this matter — just trust me. 3. Italy is a lot of waiting. See lesson #1. Other than the trains, there really isn’t much that runs on a “schedule”. Bring comfortable shoes and a lot of patience, especially when exploring tourist sites. 4. People go on strike as if it were a regular part of their job. This was a fun lesson to learn. Day 1 – the flight attendants were “on strike” and, for them, this meant that they were not serving any refreshments on the flight. Day 2 – the tour guides at Pompeii were “on strike” in the morning leaving us to change our plans to do an afternoon tour. At least they let us know in advance… Day 6 – the bus drivers were “on strike” in Amalfi meaning that the bus I was waiting for in Positano was never coming. Thankfully, a traveler in a cab stopped at the bus stop on his way through town to let me know after 2 hours of waiting. Again, see lessons #1 and #3. 5. Good restaurants don’t fill up until about 10PM. Americans are not accustomed to eating this late but in Italy, and several other European countries, dinner is much later in the evening. I tried to wait it out a few times and figured I would arrive at 9PM to fit right in. However, this was not the case as the restaurants were pretty quiet until closer to 10PM. If you want a seat at a sidewalk table, plan to be there earlier, but otherwise, Italians arrive later for dinner. P.S. There won’t be much turnover at the good restaurants either. If the place is full, expect it to be that way all night (unless it’s a tourist restaurant). Italians take their time with their meals and enjoy their dining experience with wine and company. They aren’t going anywhere quickly. 6. Rick Steves is an excellent tour guide. Knowing that I would be venturing out on my own in Rome and Florence, a new travel friend of mine suggested that I download Rick Steves’ audio guides for the two cities. There were a few options to choose from based on a variety of tourist sights of interest and all of which were free. I downloaded one for the Colosseum, another for the Sistine Chapel and a third that took me through the neighborhood of Trastevere. These audio tours were great because they kept me informed and interested in the sights I was exploring, and were free! 7. Never eat at a restaurant that is filled with tourists. Find a spot that’s strictly Italian patrons. If you want to find the best food, follow this advice. There are many delicious options to choose from but, for a real Italian experience, go where the locals go. I think one of the best ways to do this is by walking around neighborhoods and taking note of where people are eating. If you notice a lot of tourists, skip it as it will likely be overpriced and heavily salted, too much cheese, not authentic, etc. I prefer to find the local spots when I travel and therefore found restaurants with patrons speaking Italian and without anyone standing outside flagging me down. 8. Italians hate coin change. Most items are rounded up to the nearest dollar (including tax!) to avoid the use of coins and simplify bill paying. Coins weigh you down, man. I appreciated this lesson. 9. Italians don’t honk at pedestrians. I lived in New York City for two years and had to learn the fast pace of the city quickly. New Yorkers speed walk everywhere, bunch up at the edge of the cross walks, and often dart across streets before the cross walks blink with permission. New York drivers also abide by this fast paced rule and will be quick to use their horns for any pedestrians standing in their way. However in Italy, I loved stepping out into the road to cross and not having anyone honk at me. 10. Beaches in Italy are filled with rocks rather than sand. Wear sandals down to the shore or climb along the larger boulders and jump into the water. This is another lesson I learned quickly after my first glorious yet painful beach visit. While us tourists hopped along the rocky beaches and into the water, the knowledgeable Italians headed to the larger boulders on the sides of the beaches to climb up, lay out, and dive off. Again, take a tip from the locals on this one. It will spare you the uncomfortable walk into the sea. Great tips, Ali. I hope to get there one day.